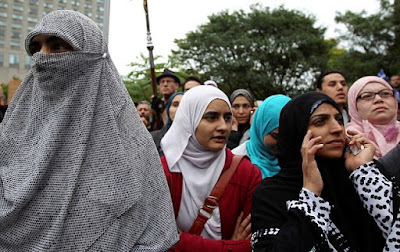 Quebec will become North America's first province to ban its citizens from wearing face coverings in what civil rights experts call an attack on the Muslim community. The Quebec National Assembly moved to adopt the legislation on Wednesday, which compels residents to show their face while giving or receiving public services. The law, named Bill 62, is the result of a decade-long dispute concerning the religious community as it relates to the public sphere. Implementation of the law has yet to be worked out, but critics fear the new legislation will disproportionately affect Muslim women who choose to wear traditional garments such as the burqa or niqab. Justice Minister Stéphanie Vallée said the law will affect anyone who uses state services, such as bus transportation, medical care or checking out a book at the library. » Why Is This Female Footballer Covering Her Private Parts?